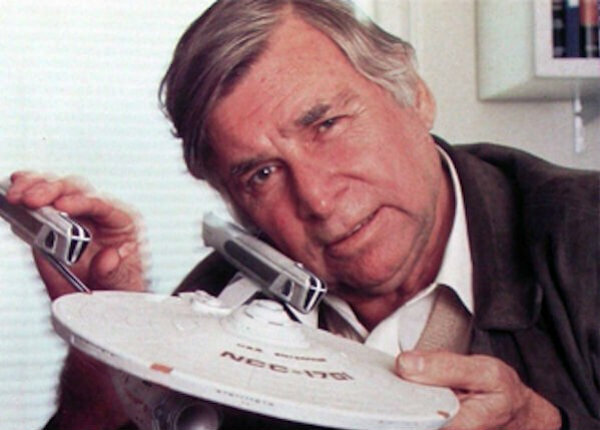 The late Gene Roddenberry, creator of the "Star Trek" franchise. The Television Academy announced Star Trek as the 2018 Governors Award recipient, recognizing the visionary science-fiction television franchise and its legacy of boldly propelling science, society and culture where no one has gone before. The prestigious award winner was chosen by the Television Academy board of governors; and the honor will be presented to CBS Television Studios during the Creative Arts Emmy Awards ceremony on Saturday, Sept. 8, 2018. The Governors Award, which debuted in 1978, honors an individual or organizational achievement in the television arts and sciences that is exceptional and universal in nature and goes beyond the scope of annual Emmy Awards recognition. Mark Spatny is the chair of the Governors Award committee, and John O’Brien serves as vice chair. Created in 1966 by visionary writer-producer Gene Roddenberry, the original Star Trek series sparked a cultural phenomenon, which has extended over 50 years on-air, with more than 700 episodes and 13 movie franchises. Star Trek’s multiple television series have garnered 30 Emmy Awards. What began as a television show grew into an entertainment franchise that has consistently depicted humanity’s greatest hopes for a better tomorrow. Throughout Star Trek’s multiple series, viewers were exposed to a world where technology and science helped improve the human condition. Futuristic technological advancements featured in the show bear striking resemblances to the cell phones and virtual reality systems in use today. From casting decisions to plot points, the series has consciously pursued diversity and equality, providing an optimistic depiction of a diverse and just future that inspires its audience. The original Star Trek provided a war-torn, culturally divided audience with a sense of hope for the future, one in which race, gender and nationality mattered significantly less than one’s capabilities and strengths. The show actively cast actors of various ethnicities in roles of respect—an actor of Russian descent portrayed Ensign Chekov during the Cold War and an African-American woman portrayed Lieutenant Uhura during the Civil Rights Movement. Further, the character of Lieutenant Uhura (portrayed by Nichelle Nichols) inspired Dr. Mae Jemison, the first African-American woman to fly in space and was described as a symbol of hope for equality by Dr. Martin Luther King Jr. himself. In addition, the franchise is responsible for significant visual and special effects innovations that have set the standard for television production, advancing the art of motion control photography, video, and digital compositing and editing as well as computer graphics. Previous recipients of the Governors Award include last year’s honoree ITVS; American Idol; A+E Networks; William S. Paley; Hallmark Cards Inc.; Masterpiece Theater; Comic Relief; the ABC, CBS, FOX and NBC networks for America: A Tribute to Heroes; and the “It Gets Better” Project. The TV academy said it is reviewing Bill Cosby's inclusion in the academy's Hall of Fame following his sexual assault conviction.